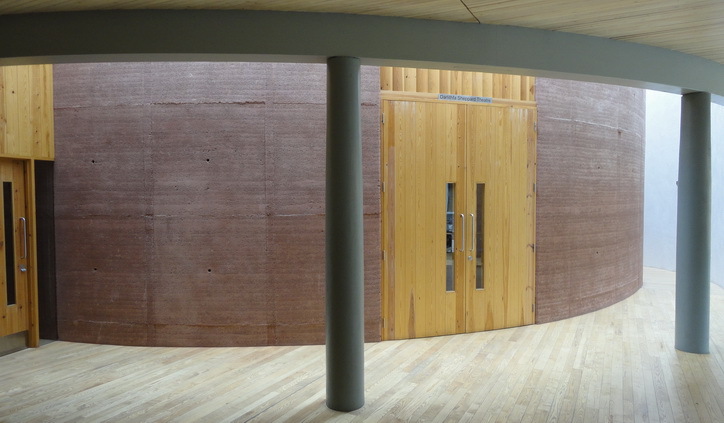 The rammed earth Shepperd Lecture Theatre at The Wales Institute for Sustainable Education at CAT, the Centre for Alternative Technology, took rammed earth in the UK to a new level. Plenty more images of the rammed earth build and walls. As part of the overall energy design of the building the 430 tonnes of earth structure ensure that the air temperature is steady winter and summer, and the building remains comfortable throughout. This means that there is no shading needed on the extensive south facing glass walls, fully using the available solar gain. The walls themselves are built from earth which has a maximum clay content of 7%, enough to give the strength required both when the walls are finished and dry, but critically while they are still new and supporting themselves and the roof above. The formwork used was a commercially available concrete system, but instead of concrete it had earth placed and rammed inside. The 1.2m x 1.2m panels weighs 90kg so each one had to be craned into place. The work was done by site carpenters trained and expert in concrete formwork but now having the challenge of a new technology to deal with. tonne bags. These where mixed for moisture consistency on site before being placed in the formwork. 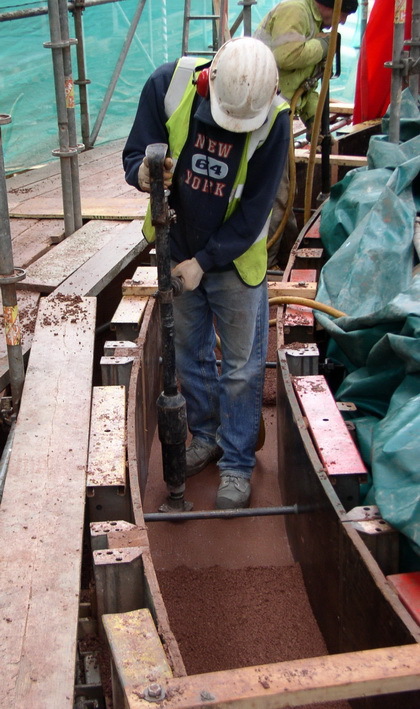 All the work was done by a workforce which had no previous experience of rammed earth, and with two days on site training. To mobilise a contractor in all the operations involved in formwork assembly, material handling, placing and ramming requires experience and a willing participant. Much of the technology is already known, health and safety, material handling, plant and equipment, it is the other particular issues about the earth, how moist it is, how to test that on site, care with the fill layers and ramming that needs to be taught and understood and acted on.